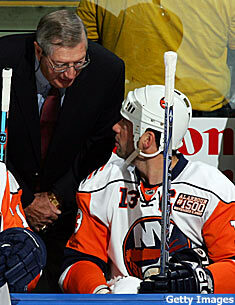 It didn't take long for Al Arbour to get back into the swing of things behind the New York Islanders' bench. UNIONDALE, N.Y. – The “radar” was back on at the old Nassau Coliseum on Saturday night for one last hurrah. The Islanders may not want to turn it off. While regular-season game No. 1,500 under legendary coach Al Arbour was quite different than the 1,499 that came before, the one thing that looked familiar despite the 13-plus years between games was the bespectacled man standing behind the bench. Arbour, known as “Radar” for his thick, dark-rimmed glasses, stood side-by-side with current Islanders coach Ted Nolan, his 75-year-old left shoulder less than a stick’s length away from Nolan’s 48-year-old right one throughout the Islanders’ 3-2 come-from-behind win over the Pittsburgh Penguins. The Hockey Hall of Famer, who led the Isles to four straight Stanley Cups from 1980-83 and last coached in the NHL in 1994, is now the first coach in NHL history to coach 1,500 regular-season games with the same franchise. Arbour, though, said he bit his tongue a lot during the game because he never felt he should tell players whose names he didn’t even know what to do and what not to do. The players, though, were tickled just to see him on their bench. Arbour’s return also sparked some of that old Islander comeback magic, against the same franchise that succumbed to the same kind of drama 1975, 1982 and 1993. The Penguins took a 2-0 lead early in the second period. After Ryan Malone scored a power-play goal 12:06 into the game, Tyler Kennedy got his first NHL goal 1:48 into the second – although it took several minutes to be awarded. Kennedy’s wrist shot sailed over the shoulder of Rick DiPietro and just underneath the crossbar, but the puck came blazing out of the net and was originally waved off. Play continued for another 1:51 before a whistle finally blew, and replays showed that Kennedy had indeed scored. But the Islanders got on the board when Trent Hunter cut the deficit in half with his third goal of the season. Hunter capitalized when an errant pass by Crosby bounced off the boards and into the slot, and the Isles’ forward collected the loose puck and fired a wrist shot past Marc-Andre Fleury to make it 2-1. The Isles ran into trouble with 6:04 to play in the second, when Crosby’s stick caught DiPietro in the eye, causing the No. 1 goaltender to be replaced by Wade Dubielewicz. DiPietro was taken to the hospital after the game, but his injury is not considered serious. Miroslav Satan scored the first of his two goals 5:30 into the third, taking a nice pass from Josef Vasicek and firing a wrist shot from between the circles past Fleury to tie the game, as Arbour and Nolan pumped their fists simultaneously. But Satan wasn’t done. With 2:41 left in regulation, he sent the Isles’ bench and the capacity crowd into a frenzy when he slammed home Marc-Andre Bergeron’s rebound to give the Islanders their first lead of the night. When the final horn sounded, Arbour pumped his right fist in the air and had a huge smile on his face. He got a congratulatory handshake and pat on the shoulder from Nolan, and handshakes all around from nearly every Islander. Then he stood there, still smiling and just as proud as he had been 739 times before, as the crew set up for a postgame ceremony in his honor. Arbour, though, wasn’t taking any credit for the win. However, Arbour, who was nervous and quiet at the start of the game, was vocal during the Islanders third-period comeback. Nolan said he consulted with Arbour on various line changes and combinations. He also sought out Arbour’s keys to the game beforehand. “Toward the last seven minutes of the third period, you could certainly hear him,” Nolan said. However, when he was asked if he misses coaching, Arbour didn’t hesitate. In typical Arbour fashion, he wanted no extravagant pregame ceremony honoring him and his return. The festivities were instead saved for after the game, when the Islanders welcomed back many of Arbour’s former players, including Mike Bossy, Bryan Trottier, Butch Goring, Ed Westfall, Clark Gillies, Pat LaFontaine, Jean Potvin and several others to help raise a new banner to the rafters with the number 1,500 stitched on. Arbour said no one had told him about the banner-raising ceremony. “That really touched me,” Arbour said. Rumor has it the Islanders have plans to raise a banner with the new number later in the season. Arbour’s family, including his wife, Claire, and 18 other members were also part of the ceremony along with owner Charles Wang, GM Garth Snow, and John Collins, an executive from the National Hockey League. Even though the Islanders granted Arbour’s request for no pomp and circumstance before the game, it was quite evident this was not your typical November regular-season game – and that had nothing to do with Crosby’s presence. An hour before the game, videos of Arbour began streaming on the scoreboard, including the night in 1997 when he said goodbye to the franchise and watched his “739” banner go up to the rafters, as well as his press conference on Friday welcoming him back. A red carpet was rolled out on the ice for Arbour’s walk from the entrance way to the bench, and when he was introduced he got yet another roaring ovation as he made his way to his old turf. After the lineups were announced, Arbour, not Nolan, was introduced as the head coach. Fellow Hall of Famers Scotty Bowman, who gave Arbour his start as a coach, and former Isles’ GM Bill Torrey, who brought “Radar” to Long Island in 1973, each dropped ceremonial first pucks. However, prior to that, the Islanders introductory video played. It usually displays Nolan followed by each player saying their name and, “I’m an Islander.” On a normal night the clip ends with Guerin -- but normal didn’t apply on Long Island on this night. On this night, the clip ended with Arbour staring into the camera, his glasses resting firmly on his face. He got the loudest ovation of them all.